Buddhism during the han dynasty was regarded as having its basis in magic in much the same way as Taoism and it first took root among members of the royal family and aristocracy. During the Three Kingdom Period Buddhism was studied as an independent subject. Luoyang in North China became a major center where there was a focus on the translation of the scriptures while in South China Buddhism thrived in a tolerant atmosphere. 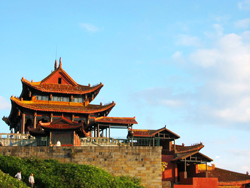 The jin dynasty witnessed the popularization among ordinary people. In 401 Kumarajiva was invited to Chang'an from the Western Region that lay to the west to Yumenguan Pass and together with 3,000 scholars translated 74 sutras. Obviously, this was an event of great importance to spread of Buddhism. During the jin dynasty a new class emerged; that of the scholar-bureaucrats. They brought together the established, popular metaphysics and Buddhist doctrines. In the north of China there were quite a few reputed monks while in the south many scholar-bureaucrats were well versed in Buddhism. The royal families were passionate toward Buddhism and granted monks and nuns considerable privileges. The number of temples mushroomed to 1768 and with them as many as 24,000 monks and nuns. Monks were to become a new class in China and Buddhism took a firm hold on the country. Buddhism continued to flourish during the Northern and Southern Dynasties. The now famous Longmen Grottoes and Yungang Caves were constructed during this period. The most important event was when Bodhidharma came to China. He arrived in Guangzhou and then went on to Nanjing where he entered into discussion with Emperor Wu of Liang in the Southern Dynasty. They failed to agree over matters of doctrine and so Bodhidharma went to the Shaolin Temple. Bodhidharma was the first Patriarch of Zen Buddhism, the formation of which marked the independent development of the faith in China. This localized sect of Buddhism had a profound repercussion on Chinese philosophy and culture. 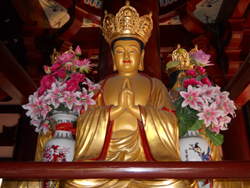 Buddhism reached its zenith during the Sui and Tang Dynasties. Emperor Wen of Sui ordered the restoration of temples and statues of Buddha that had been destroyed during northern zhou. Tang Emperors claimed they were descendents of Lao Zi, the creator of Taoism and paid homage to Taoism but in practice they recognized the importance of Buddhism. An Institute was set up to translate Buddhist sutras in the Big Wild Goose Pagoda in the capital city of Chang'an (today's Xian). Xuan Zang was the most reputed monk at this time, and it was his journey to India that was the model for the Ming novel The Journey to the West (also known as the Monkey King). Hui Neng (638-713), the sixth Patriarch of Zen Buddhism, should not be ignored. His famous verses, "Originally there was no Bodhi-tree, nor stand of a bright mirror. The mirror was originally clean and pure; where can it be stained by dust?" These words have otherwise been translated as: "The Tree of Perfect Wisdom was originally no tree. Nor had the bright mirror any frame. Buddha-nature is forever clear and pure. Where is there any dust?" These lines have become the first thing to pop into the mind when people think of Zen. In 730 Hui Neng's disciples won debates with other sects and Zen was strengthened in China. 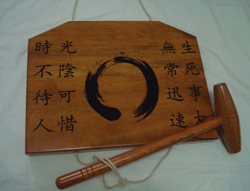 Zen was introduced to Korea in the 8th Century and to Japan at the end of the 12th Century. Buddhism penetrated daily life and had a substantial impact in architecture, sculpture, painting, music and literature. However, Buddhism was forbidden in 845 due to social and economical reasons. Over 4600 temples were demolished and 260, 500 monks and nuns were forced to give up their religion. The combination of Buddhism and Confucianism led to the formation of Li Xue, the Confucian school of idealist philosophy of the Song and Ming dynasties. This tradition was inherited by the qing dynasty and Zen became synonymous with Han Buddhism. 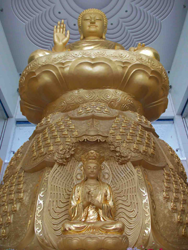 Over its long history, Buddhism has left an indelible impact on Chinese civilization. Many words and phrases have root in a Buddhist origin. Take a colloquial phrase as an example, 'to hold the foot of Buddha at the moment" means "to make a last minute effort". This reveals in a sense the true attitude of the Chinese toward the utilitarian aspects of belief. Many people kowtow to whatever gods they encounter and will burn incense in any temple. In literature traces of Buddhism and Zen are obvious. Quite a few famous poets in tang dynasty like Bai Juyi were lay Buddhists but this did not prevent them from indulging in a little from time to time. Just as today's white collar classes go to bars, the Tang scholars went to restaurants to drink and flirt with the almahs. In today's China, Buddhist temples, Buddhist caves and grottoes and Buddhist Holy Mountains, especially the ones listed in the national or provincial historical and cultural relics, have become the hot spots for tourism. It is not uncommon for the income of a temple to cover the expenses of a whole county or district.